Most birds sing diurnally, resting at night. However, there are several species that sing nocturnally -- some of these birds are migratory and usually sing during the spring and summertime to find a mate. For some, these nocturnal birds can be a nuisance, as their nighttime screeching can interfere with a good night's sleep. Due to their migration patterns, some species of night-singing birds can be a seasonal spectacle, and an analysis of your location and time of year can help determine what type of bird you hear, without actually seeing the bird. The nightingale (Luscinia megarhynchos) is commonly distributed across Europe and Southwest Asia. In form and coloration, the nightingale resembles the female European robin (small, light brown). The male nightingale commonly sings in the morning, as well as at night; the day-singing birds do so to patrol their territory, whereas the night-singing nightingales sing to find a mate. Since nightingales are spring-mating birds, that is the only season in which nocturnal-singing nightingales can be heard. 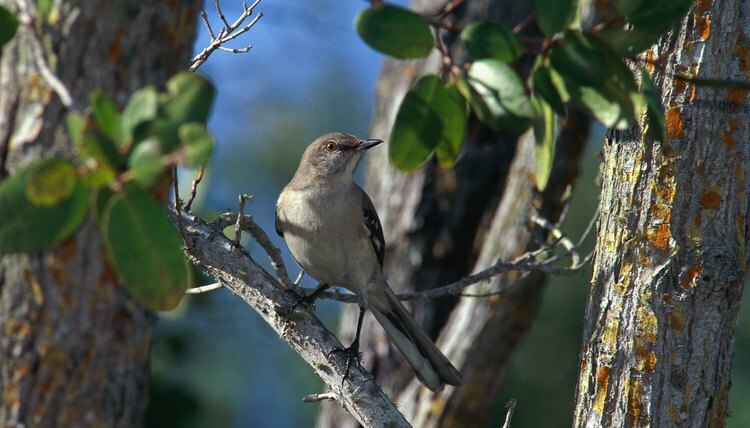 The northern mockingbird (Mimus polyglottos) is distributed across almost all of North America, from Southern Mexico to Southern Canada and on many Caribbean islands. The mockingbird is a medium-sized bird; its body is mostly gray, with white markings on its wings. The male mockingbird is a particularly loud bird (mockingbirds have an immense repertoire of calls), exhibiting aggressive behavior when it comes to protecting its territory. Mockingbirds sing all during the day, and some will sing at night, too. Night-singing mockingbirds commonly do so close to a source of bright light, so they often end up singing outside of house windows. The whip-poor-will (Caprimulgus vociferus), also known as the nightjar, is common in the Eastern United States during the summertime. This bird is difficult to spot in a tree due to its small size and coloration; its brown-black camouflage allows it to blend in perfectly. The whip-poor-will does not sing during the day, when it rests among branches; the bird begins singing at dusk and can carry on for several hours. The corncrake (Crex crex) is distributed across Eurasia, from Western Europe to parts of Siberia. This bird is typically found in pastureland and meadows. The corncrake is a medium-sized bird, with reddish markings on its body and numerous, small, black spots on its wings. The corncrake's nightly call is a very distinctive, rasping screech. Since these birds do not spend as much time as others in trees, they can be encountered when walking in the countryside and can be heard in the countryside from mid-spring to late summer. What Songbirds Sing at Night?